The aim of the advanced painting class is to deepen understanding of paint handling, to gain insight into one of the great painters of history and to push the students to expand beyond their own normal approach to constructing a painting. More can be learned from imitating the masters than most other pedagogical approaches. This style of learning happens without words, without theory. It is quickly understood that the eye and hand can absorb and convey information, bypassing the verbal centers of the brain. This information is rich and nuanced and reaches into our emotional core; we feel rather than explain the process. The advanced painters each brought their own experience to this project and they will take away from it varied responses. The student learns what the mind is ready to accept; were it otherwise we could all be masters within a short space of time. My hope is that they will all find at least one aspect of Rubens to incorporate into their future work. 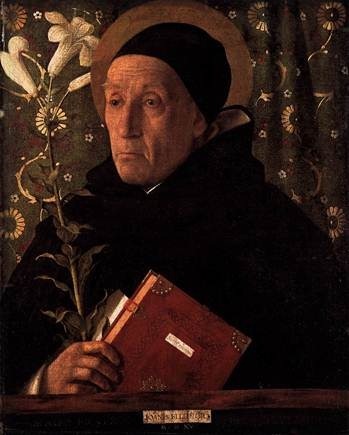 I know that my own appreciation for this painter grew as we worked and I have already put his teachings to use in my own paintings. Rubens frequently composed along the curves of an oval which rose diagonally from the lower left to the upper right of the canvas. 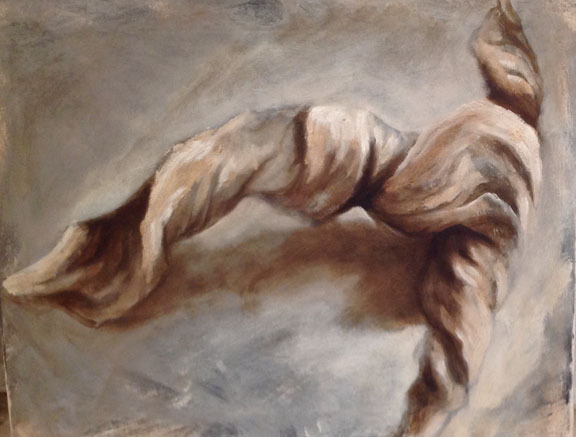 This diagonal movement gives tension and drama to his work. We have chosen a group of stock characters from his mythological subjects, centaurs and satyrs etc, and arranged them with this device in mind, placing them in overlapping positions and in reducing scale to push the space backward into the depths. We created a dark tree as a foil against the highly lit figures on one corner and opened up another to deep atmospheric perspective. The drawings, once accomplished on paper were transferred to the canvas with the perforated holes and pouncing method used by the Renaissance artists. 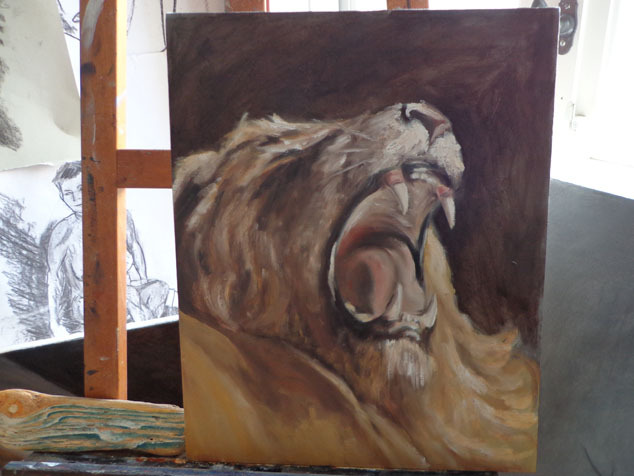 The underpainting was then set in with raw umber loosely and not too dark to keep the shadows transparent and luminous. Much of the streaky gray imprimatura was allowed to show through. Highlighting with white came next which involved oil paint mixed with chalk to give the paint textural force and an active surface. This was placed to bring the eye to areas of interest and emphasize our oval composition. More modeling was accomplished with a toned down white and then the canvas was allowed to dry. This procedure, which took several hours of group effort, brought the image to a more finished form and we began to visualize it as a whole for the first time. Rubens often used his studio assistants to bring a painting to this level and then he added his final touches in the glazing and overpainting that follows. 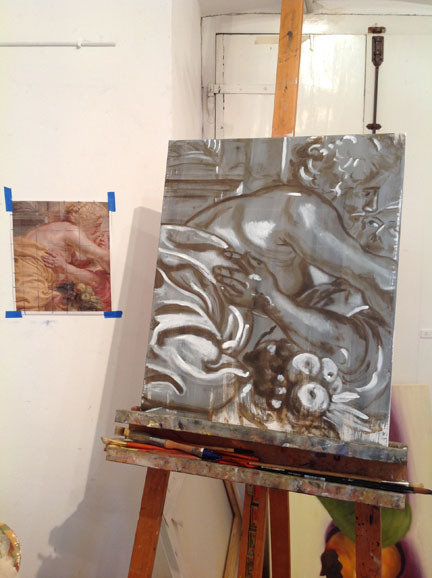 This fall, six advanced painting students are working with me to discover Rubens’ painting technique. 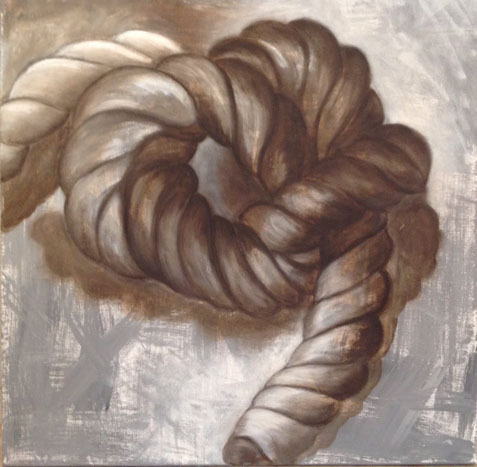 To delve into Rubens’ style we studied the twisted forms of a knotted rope and a gnarled stick to imitate his brushstroke which often follows a spiraling line. We see it in the manes of his horses and the fabric of capes, in beards and in clouds. It was also important to learn to highlight economically with white as this is the primary way in which Rubens creates dimension. 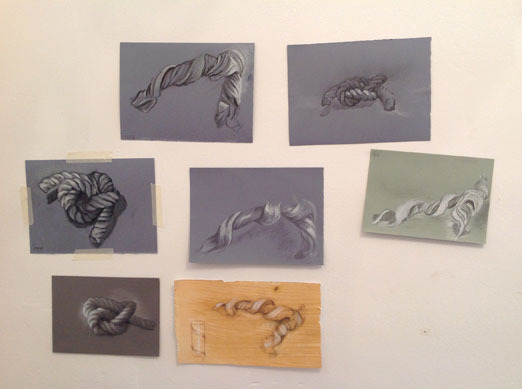 So our first study involved working on toned paper with white conte (above) and looking for expression of the twisted form. We then continued this investigation with paint (below). Copying a master work is the best way to educate the eye and hand so our next step was to copy a passage of Rubens’ work. An enlarged section is easily obtained by perusing his work on Google Art Project. It is quite clear what the layers are and how they are preserved or covered by subsequent paint. 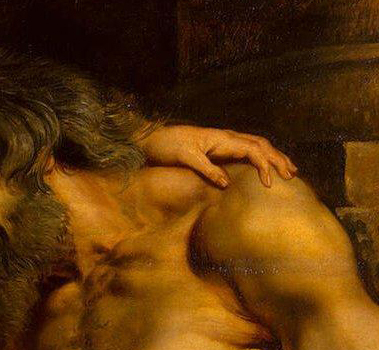 Rubens seems to do so little but each brushstroke is amazingly rich in information. Not only is the color of the object’s surface there but also its texture, tone, temperature, direction of thrust and lighting condition. He accomplishes with one stroke what others would with many. We are adding chalk to the paint as recent scholarship has detected the presence of it in his work. Chalk adds a textural component to the paint and helps it to dry quickly. Meanwhile we are composing a large canvas to include five or six figures which will give each student a chance to contribute to the piece. 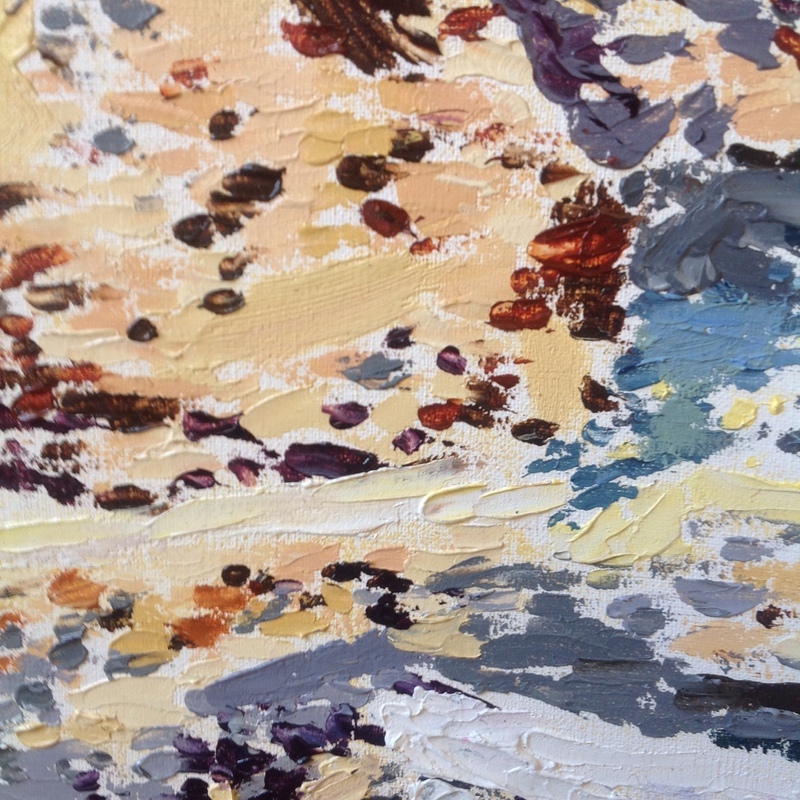 Detail of impasto impressionist painting by student Annette Kolzow. We admire masterworks in museums for, among other things, their brilliant colouring, their longevity due to the painter’s technical expertise and for the evidence of the artist’s hand in the brushwork. Many paint effects from the past seem nearly unattainable with modern materials and this has lead artists to try to rediscover secret formulas or find additives that emulate historical processes. Resins, wax, and complex chemical mixtures have all been tried. Research done by the National Gallery in London however has revealed that linseed oil, coloured pigment and additions of calcium carbonate are the sole ingredients in many master works before the 20th century. 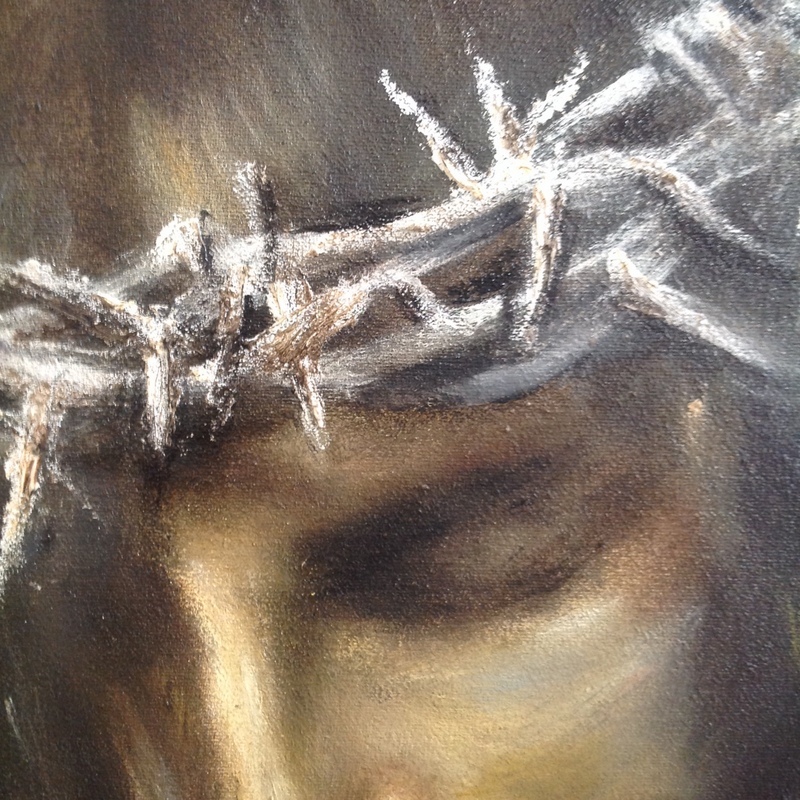 Detail of Rembrandt painting by student Annelise Grindheim. Though we are seduced by the ubiquitous presence of modern materials, traditional methods are intriguing and wonderful to investigate. Egg tempera and encaustic have both had a renaissance in the last twenty years. The fundamental substance of oil painting however, which is the oil itself, has been accepted as standard by most artists. Modern linseed oil is alkali cleaned and heated, it is no longer manually pressed and sun thickened as it was. Some artists with curious minds have now reexamined the refining of the flax oil. Louis Velasquez and Tad Spurgeon both have websites dedicated to methods of hand refining oil to produce a non yellowing, flexible, fast drying oil which completely transforms the painting process. What they have uncovered in their investigations is a remarkable way to access an old and very successful formula. Student Makenzie Sullivan’s study of Velazquez. My involvement in this exciting investigation began when I assigned Velazquez, the 17th century painter, as the topic of my advanced painters seminar. We looked into the addition of marble dust, a form of calcium carbonate, to his paint. I stumbled on the information about hand refining oils then but felt it was too intensive to delve into at the time. It took me several more years and further seminars on Rubens and Vermeer before I took the plunge and followed procedures I had read about online. The results are quite amazing to me, and the difference from the handling of modern tube oils is significant. The hand refined oil makes many things possible which I had read about and seen but had not been able to obtain. I always felt tube oils were too slippery, too thin, too flat once dry. I also found the suede effect annoying and could not build up impasto areas without needing many days of drying time. The hand refined oil has none of these defects. 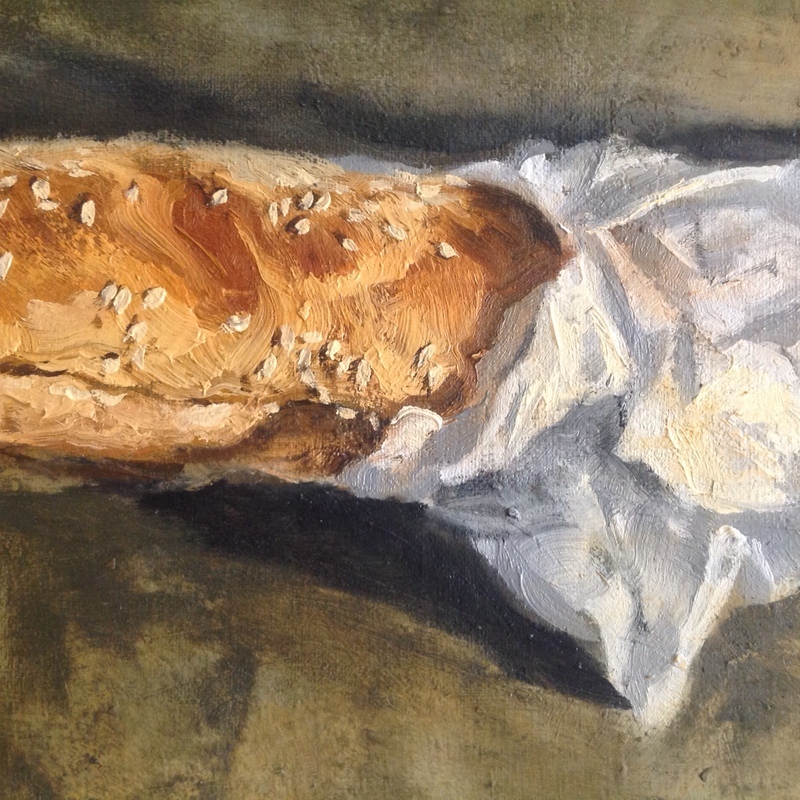 Impasto brushwork by Seamus Heffernan. This semester I introduced the new oil to students and we worked together to understand its potential. It is more flexible, shinier and forms a tougher film than the tube oils. 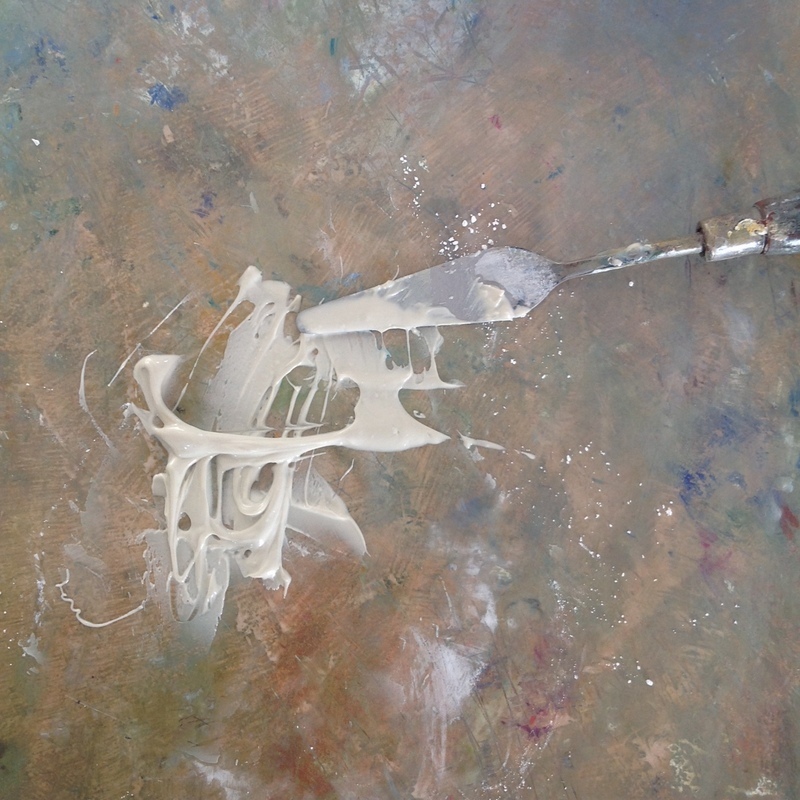 The viscosity of the paint allows one to paint wet into wet without loosing brushstroke integrity and colour purity. It is far more transparent, the glazes are deep and clean, and it dries evenly and quickly without darkening as much. Impasto areas can dry overnight, depending on the weather, and keep their sharp edges and texture. The best part of all of this is that solvent has been banished from the studio. We clean our brushes in vegetable oil and never thin paint with solvent. The smell of the new oil is something like fresh grass or fields of flowers. Because we mix it 1:3 with chalk and then use that 2:1 with tube paint our paint supply goes much further. It is hard on brushes though, as they wear down quickly. One wonderful advantage is the ability to wipe off the paint completely from a dry underlayer making changes in plan easy to execute. 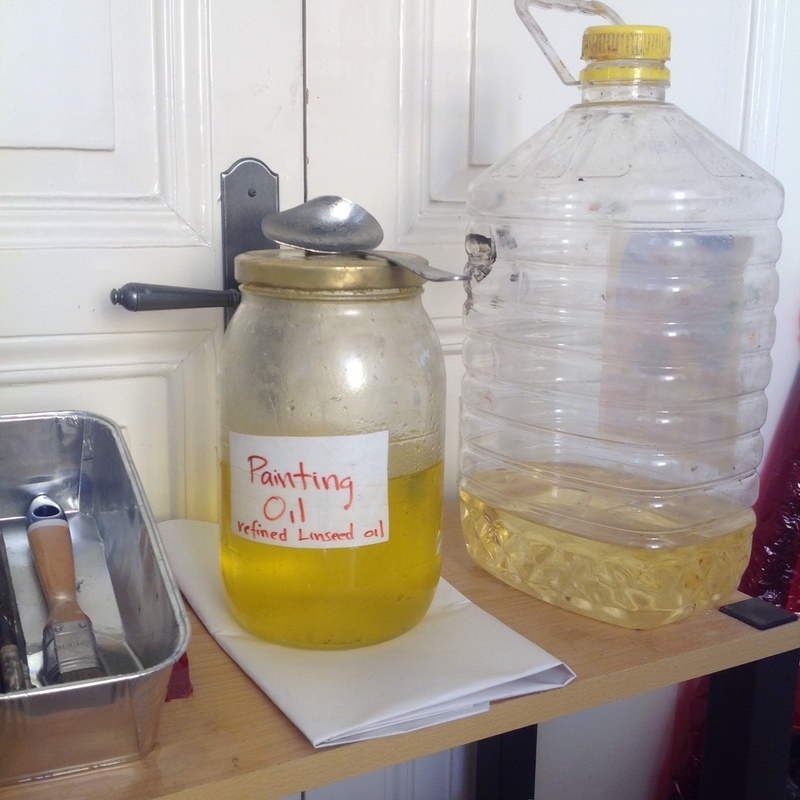 The hand-refined painting oil and vegetable oil with which we clean our brushes. Mixture of chalk and oil showing its viscous consistency. There has been a complete change in my approach to paint and the student work is richer and more colourful. We are able to work into surfaces more quickly which speeds our process. The studios are no longer redolent with turpentine and the improved environment is beneficial for all who share our space. 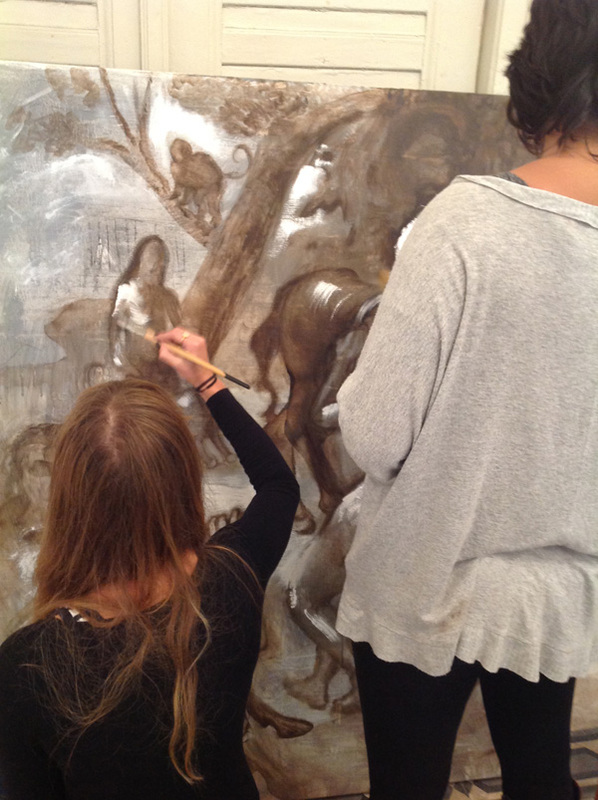 The advanced painters this semester are examining the famous division between the merits of drawing versus color. We have done some reading on the subject and are working on portraits using the two different methodologies. The drawing approach favors a study of form and a clear use of line and shading techniques to depict the geometry of the face. The coloristic approach seeks patches of color which border other colors to turn form and to show light. This requires a clear understanding of color mixing: warm vs cool, light vs dark and pure vs neutral. The debate between the merits of drawing versus color has been a long standing one. The most famous proponents of drawing were Florentines in the 16th century who disdained the colorists of Venice. Titian’s broken colorful brushstroke was to them evidence of poor draughtsmanship. This debate was forwarded to each successive generation and finds such artists as Poussin and Rubens on opposing sides. Ingres and Delacroix fought a similar battle. The muscles and bones of the Florentine male nudes are perfect subjects for a drawn approach. Vasari rightly praised Michelangelo as the supreme master of this art. 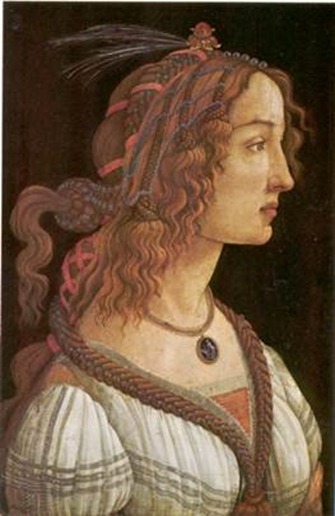 In Venice the preference for the female form in landscape was better suited to a coloristic handling. One thinks of the Giorgione nudes in the soft enveloping color of evening. Subject matter may influence the choice of one method over another but it may simply be personal outlook or the type of training an artist receives which determines the way to proceed. The finite correct world of drawing appeals to the intellectual mind. A line which describes a form is either correct or it is not. The color approach on the other hand captures a more fleeting, emotional, infinite world, one which shifts moment to moment with the changing light. These two renderings of an eye show the different mindsets. On the left Sargent finds color swatches to depict the folds around the ball of the eye. 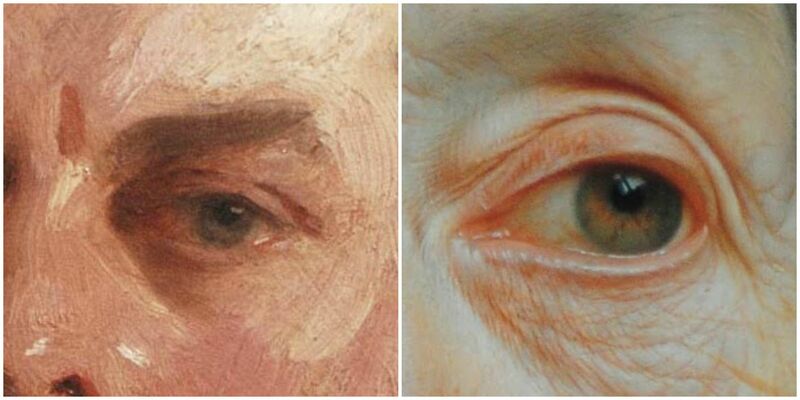 The painting by Christain Seybold on the right gives us a linear understanding of every part of the eye. Although they both use color the priority given to line or to color is evident. A paragraph from the story “The Unknown Masterpiece” by Balzac summarizes the confusion which arises when an artist is hovering between form and color. 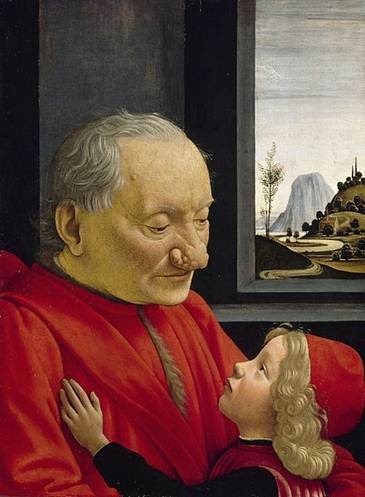 The master painter, Frenhofer, is critiquing a work by the painter, Porbus. This charming story goes on to explore many aspects of the painter’s world. Balzac seems to have been a close listener to his painter friends and gives us this glimpse into studio practices. Whether a contemporary painter favors color or drawing to construct an image is immaterial. The debate about their relative merits is interesting to art historians and art connoisseurs. But the art student is less confused about choices to be made when the two issues are separated and defined so that, unlike the young painter in Balzac’s story, one is not hesitating between the two worlds. Euphrosyne Doxiadis, working her persuasive powers and demonstrating her intense passion, gave the students two wonderful lectures this last month. 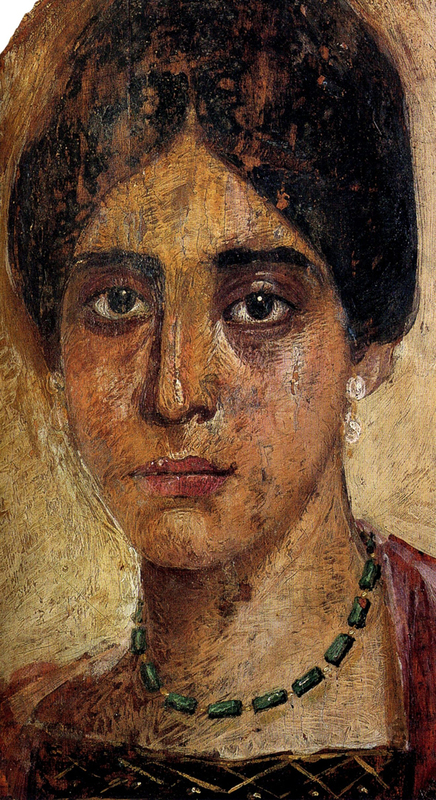 Her first, The Mysterious Fayum Portraits, opened their eyes to the high level of artistic wizardry which created the portraits of people living in Hellenistic Egypt in the first century after Christ. These portraits look wonderfully fresh and alive after being pulled from the sand of the desert where they had been affixed to mummies. We wonder at their clarity, color and modern feel. The painting students who are currently learning the four color palette, the same ancient system as was used by the Greek masters, saw the depth and variety this limited palette allows. 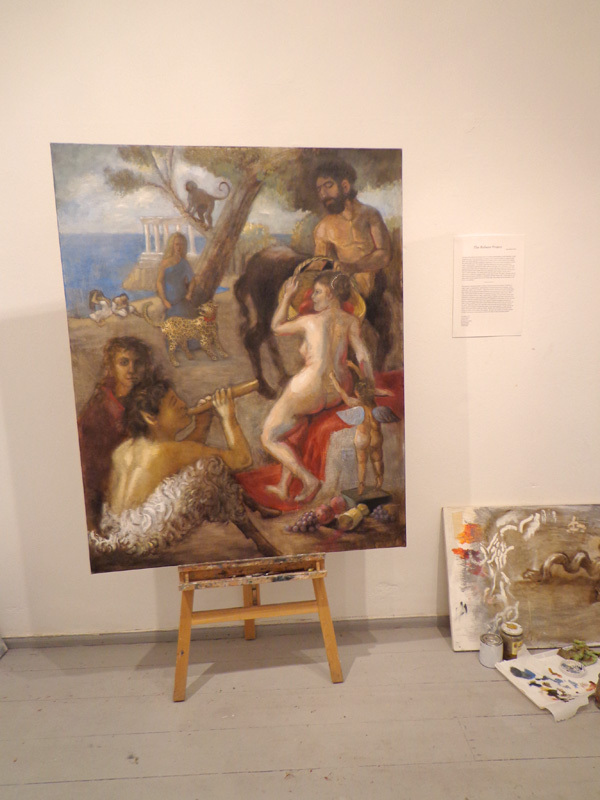 Euphrosyne went into some detail as to the technical procedure so that the students could realize they are participants in a long line of painting tradition spanning the ages. 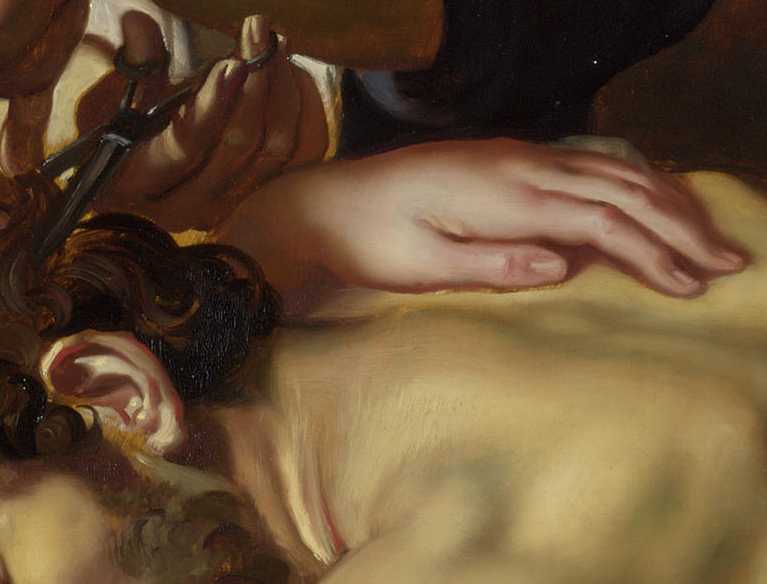 Detail from Samson and Delilah by ? The second lecture was equally fascinating. Euphrosyne believes, and has convinced us all, that the Rubens painting in the National Gallery in London, the Samson and Delilah, is a forgery. With precision and evident distaste she pointed out the particular flaws which demonstrate that this could not be an original: the lack of convincing brushwork, the flattened spacial elements, the poor understanding of form, the inky black background that comes against but not behind the figures. All of these things and many more are tell-tale signs that Rubens had no hand in the piece. Her website http://www.afterrubens.org tells the whole story. No one left the lecture with any doubts. 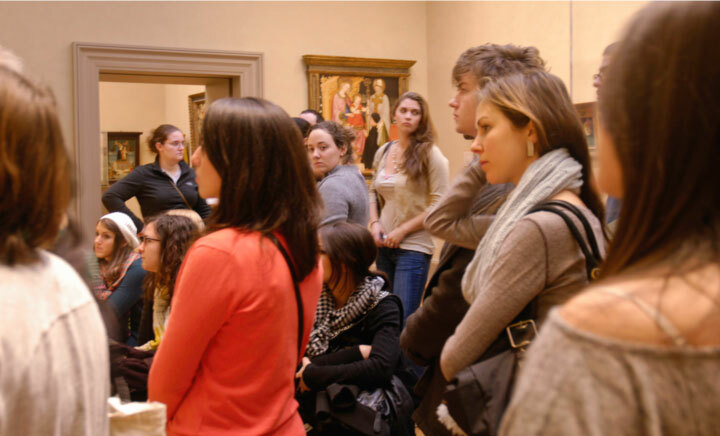 Before our winter trip to America, mostly to see our family in sunny San Diego, we invited friends and students of the Aegean Center to join us at the Metropolitan Museum of Art in NYC. (I don’t say former students, since I still think of them – of you – as ongoing students and colleagues.) We had done this two years ago, when twenty-five joined us. This year another twenty-five managed to come, and we made a rich day of it. Most of these students heard about this on Facebook, so it seems the site is actually good for something other than exclamation points. And Elizabeth and I were delighted that so many are living in or near the city, or were there for the holidays. New York is our home city, and the labyrinthine Metropolitan is the museum we know best. The oldest student was Drew Weidemann, whose pictures of the event can be found on Franklin Einspruch’s site, here: http://www.artblog.net/post/2012/01/carson. Drew, now a professional photographer (www.drewwiedemann.com) was a student twenty years ago, and Franklin was a student a few years later and then an assistant to Jane; now he is a painter and noted art critic. Christine Linclau, a student a mere decade ago, only found out at the last minute, and came down from her office at the museum, where she is digital librarian, to greet us all. Jessica Freedman, working at a gallery, came at the end. The youngest – well, there were several nineteen year olds – was probably Anna Deming. None of our students, of course, is ignorant about art, its lessons and delights. And John Masters and Jackie Massari are again here on Paros, trying not to be too distracted by Aegean spring. The Met is huge, and a selection must be planned. Since all of us had studied Greek art together, and most of us had studied Italian Renaissance art together in Italy, we naturally stayed close to the Mediterranean. But we also wandered. Did the museum know we were coming? 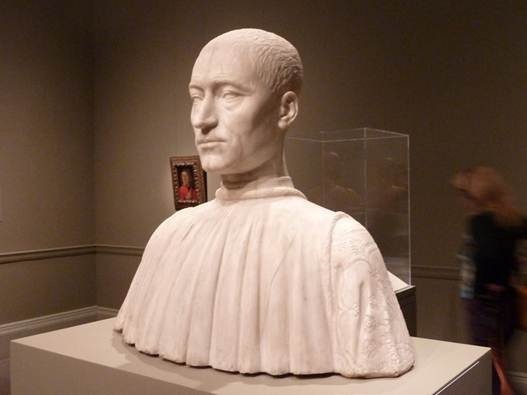 For it had mounted one of the best shows we have seen in years: “The Renaissance Portrait from Donatello to Bellini” – spacious room after room of Italian portraits from about 1425 to about 1515, by artists including Donatello, Filippo Lippi, Botticelli, Verrocchio, Ghirlandaio, Pisanello, Mantegna, Bellini, and Antonello da Messina. Our etesian September often focuses on the new conception of individuality the Italian cities achieved, not based entirely on mere class and lineage. Men and women wanted to be portrayed as they were, but with intimations of inner vitality and strength. 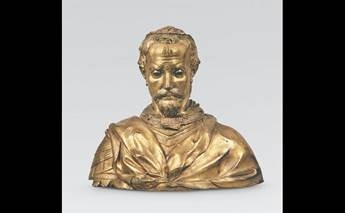 In the Bargello Museum in Florence, I often point to Donatello’s terracotta bust of Niccolò da Uzzano as the first true example of this new sensibility; though that piece did not make the journey, Donatello’s silver Reliquary of Saint Rossore, from the Pisa Museum, did. In the same room as this masterpiece, a realistic drawing by Fra Angelico again demonstrated that Fra Giovanni was not a mediaeval holdover but at the forefront of the new movement formulated by Brunelleschi and given theoretic expression in 1435 by Alberti, who wrote in his treatise on painting in 1435: “Painting represents the dead to the living many centuries later, so that they are recognized by spectators with pleasure and deep admiration for the artist.” We saw Botticelli at his most poetic, Ghirlandaio at his most psychologically profound, and Bellini at his most empathetic – this is as great as painting gets. The exhibition’s sculpture was equally brilliant; it is often noted that, before Leonardo, painters followed the lead of sculptors. 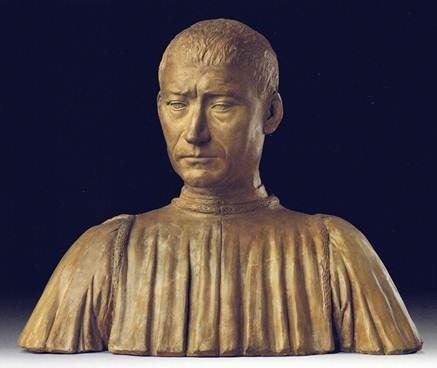 What age of sculpture has ever surpassed the Quattrocento from Donatello to Michelangelo, with stops along the way for Verrocchio, Desiderio, and Benedetto da Maiano? Benedetto’s two heads of Filippo Strozzi, a rich banker, were of especial fascination. The terracotta one, surely done from life, was meditative and detailed, while the marble one, in fulfillment of the commission, was more abstract and idealized. Going back and forth between them, one could see how the artist made the inner and outer man two aspects of a complete person, public and private, spiritual and political, sensitive and stern; it was astonishing. There were medals by Pisanello, drawings pricked for fresco translation by Ghirlandaio and Mantegna, illuminated manuscripts – and for some inexplicable reason, not too many people, so that we, a large group, could linger and discuss. But after our two-and-a-half hours in the show we were ready for a rest. 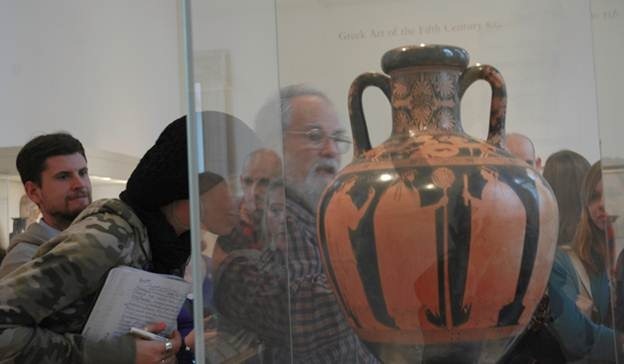 Meeting friends with whom one has much in common – in this case Paros, Italy, the Aegean Center, and art – is always a delight, and we lingered over lunch in the museum’s cafeteria. But then we got back to work, and going back nearly two thousand years, looked at Greek art, which so inspired the Italian Renaissance in its realism and craft, and is so different in its search for essential ideals, for the serenely heroic. Of course we visited the Girl with a Dove from Paros. I think most of us were thrilled that we could so readily compare what we were seeing with works we had studied together in Rome and Athens. Athens and Florence, so disparate in time and culture, both believed that proportion, fidelity to nature, and reason were divine. Both were independent republics, whose citizens were extremely interested in the arts and so knowledgeable. And Venice and Paros made accommodation for sea light. There is more than one bloom of humanism, but its root is the respect for the individual in the world. After a coffee break, we all opted for more: Titian, Rubens, Vermeer, and Velazquez. All in all, we were in the museum six hours, and left in high spirits, more exhilarated than tired. That is the effect art and knowledge are supposed to have. On the way out we stopped to contemplate the eagle from Giovanni Pisano’s great Pistoia pulpit, otherwise complete. Probably no one had looked at it, lost in its big mediaeval hall, for a year. Let this eagle be our inspiration till next time, and call us – Drew, Franklin, Christine, Anna, Lauren, Emily, Emily, Jackie, John, Christopher, Carter, Adrian, Shirin, Nikay, Jessica, Jessica, Kristin, Barbara, Brie, Arielle, Ves, Johanna, Jade, Michelle, Liz, and Jeff – to attention on what matters. When lovers of Paros get together away from the beloved island, it is always an elite occasion. We know just what we miss, where we were, whither we should like to return. When, during the spring semester of 2008, Liz and I told several students that in December we would be in New York City, where we grew up, to visit friends, relatives, and the Metropolitan Museum of Art, they importuned me to accompany them about the great museum, as I had so many museums in Italy as part of our September course of study. Usually Liz and I are so pressed for time in the city, that we can barely manage to visit one or two students, though often there are a dozen there. 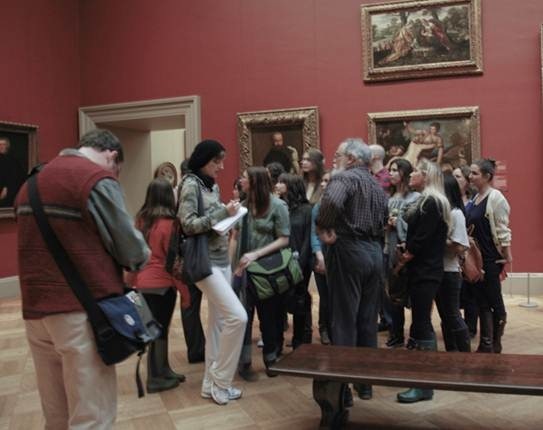 I agreed, and in early December sent out an announcement on Facebook that on December 22 Liz and I would meet any students who cared to join us in the museum’s lobby, and that we would proceed to look at great art, with plenty of blah-blah to go with it. The delegated morning was cold, and there was snow on the ground. We arrived an hour early, and soon students began showing up. By the appointed hour, 20 students had arrived; three from a dozen years ago, three from a month ago. With them were a mother, a sister, a husband, a lover, and several friends – and memories of Paros and anticipated revisitngs introduced everyone. 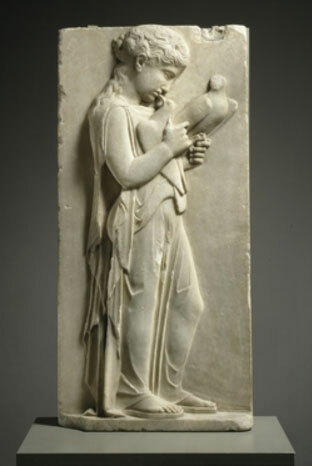 The first object we looked at, of course, was the Classical Girl with a Dove, a beautiful marble relief found more than a century ago, built into the Castro Wall on Paros. Its skill and tenderness made Paros glow in our minds. 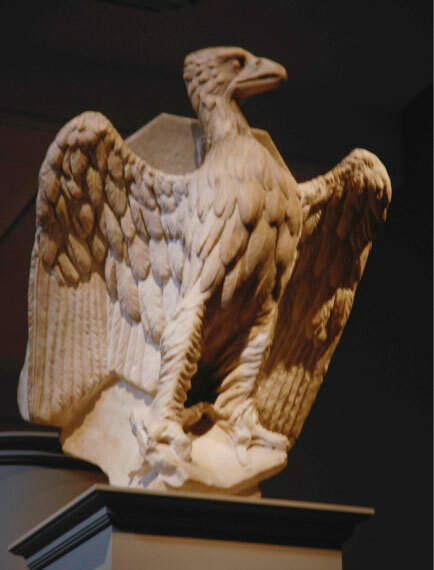 Since most of the students had studied with us in Pistoia as well as Paros, we next went to the medieval room, to inspect a sculpture that has probably not been looked at more than a dozen times in its long stay in the crowded room: the lectern, in the form of Saint John’s eagle, from Giovanni Pisano’s pulpit in the church of San Andrea in Pistoia; the rest of the pulpit fortunately remains in situ. 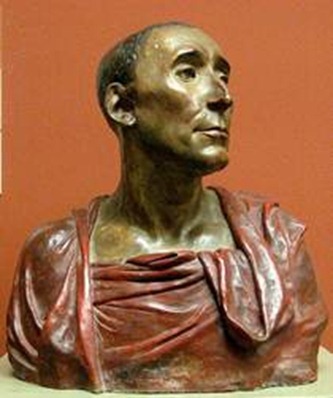 Giovanni was probably Europe’s greatest sculptor in 1300. Dominating the room was the Met’s beautiful Christmas tree and crèche, with its eighteenth-century wooden figures from Naples. Then we went upstairs to look at paintings, beginning with Duccio’s little tiny Madonna, a recent acquisition and the museum’s most expensive. We had spent a long time looking at the great Duccio altarpiece in Siena, and were almost startled to discover that our memory of the radiance of its forms and colors were not exaggerated. After an hour of Italian paintings, we moved on to Rubens, Hals, Rembrandt, and Vermeer. I don’t usually get to talk much about these artists, and lecturing focuses the attention. And although the museum was crowded for Christmas, the rooms with the greatest paintings were, as usual, sparsely inhabited. During lunch at the museum’s cafeteria we chatted, inevitably, about Paros. I was amazed and pleased to discover how many older students were still in the arts, and how many younger ones were hoping to remain so. May John, Jane, Elizabeth, and I take some credit (or blame) for this, and not just the inspiration of the beauties of Paros? 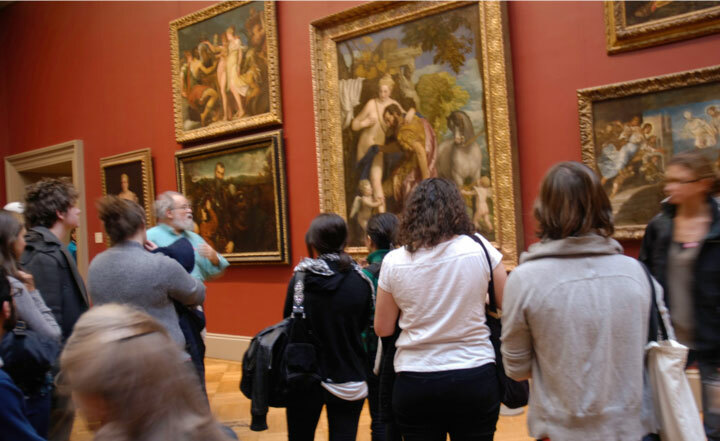 A year ago students under Jane had undertaken a Velazquez project, and the museum fortuitously had a small, choice show of the great Spanish master. 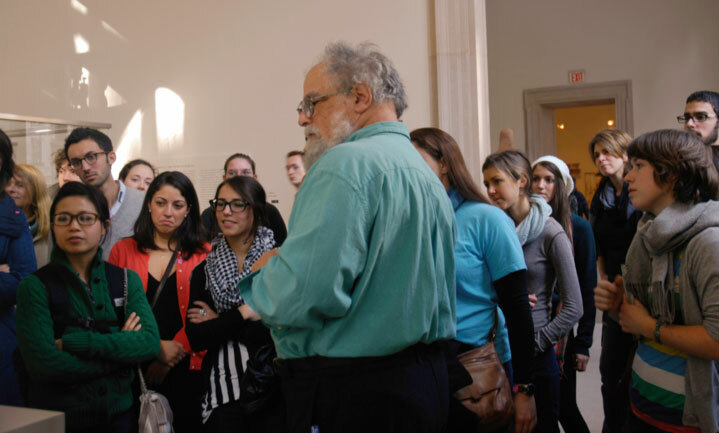 And then, for the photography students, we looked at the big Robert Frank show. It was now three o’clock, and most of us had been there almost four hours. We parted reluctantly. These were all top quality students, whose interest in art is unwavering. And it is the best students who are most likely to return to Paros, to remember what the island gave them, what the Aegean Center gave, and what they have given themselves. On a beautiful Thursday afternoon last week, the Aegean Center enjoyed a lively and interesting presentation by Euphrosyne Doxiadis. A long time friend of the Center, Euphrosyne presented two previous talks this semester regarding the Fayum Portraits and the contested Peter Paul Rubens painting of Samson and Delilah in London. Euphrosyne presented the art of encaustic painting — painting with beeswax. Byzantine icons and the portraits of the Fayum use this ancient technique which dates back thousands of years. Pigments derived from earth are mixed with the hot wax which can then be applied to a prepared surface, such as wood or canvas. Based on the tetrachromy (or four color palette) of white, black, red and yellow, this simple palette can yield hundreds of colors. Euphrosyne gave an overview of the preparation –melting the wax on a hot plate, adding mastic resin to act as a binder, adding the pigments themselves and the application of the paint with large stiff brushes. The colored wax, once applied, immediately hardened on the surface and could then be further manipulated by using electric tools to heat, melt, scratch and shape the wax. Many of the students experimented with the paint and found it exciting but challenging to manipulate the wax paint before it set. We found it would take some time and practice to learn subtle handling of this medium. On Thursday, sunny and bright, we took the bus up along the Corso, and then walked a few blocks until we found the Casa di Goethe. Carefully refurbished, it opened a few years ago; this was our first visit. The exhibition was “Italians in Weimar: Italian drawings from the 16th to the 19th centuries.” Our kind of stuff: sheets by Carracci, Rosa, and others whose drawings are often better than their paintings. The permanent collection of Goethe memorabilia – letters, paintings, and such – was also worthy, and we stayed about an hour-and-a-half. Then we walked to the nearby Piazza del Popolo, but the church was closed. We browsed the Christmas stalls in the piazza, stopped into two small churches, and then took the bus, a small electric job, to the Ghetto, where we like an inexpensive little Jewish trattoria, where Liz had braised beef with rughetta and I tripa ala romana. The previous day we had made reservations to visit the Palazzo Farnese. We had attempted several times in the past to get there, but success evaded us. Our reservation was accepted at the last minute – it is open only Thursday and Sunday afternoons, and one must take a tour in either Italian or French. The palace, the largest in Rome, is a High Renaissance masterpiece by Antonio da Sangallo; the top story and cornice are by Michelangelo. It has been the French embassy since 1874, and is immaculately maintained. When we got there, standing by one of the two fine fountains in the piazza, we realized that we had forgotten our reservation paper, and Gabriel ran back to the hotel to get it and also identification. Our tour was in French, but since we knew whereof our polite and pretty guide spoke, we understood well enough. What a beautiful place, quiet and polished: the “neoclassical” courtyard, the formal garden, the beige stone courtyard with travertine trim, all perfect. 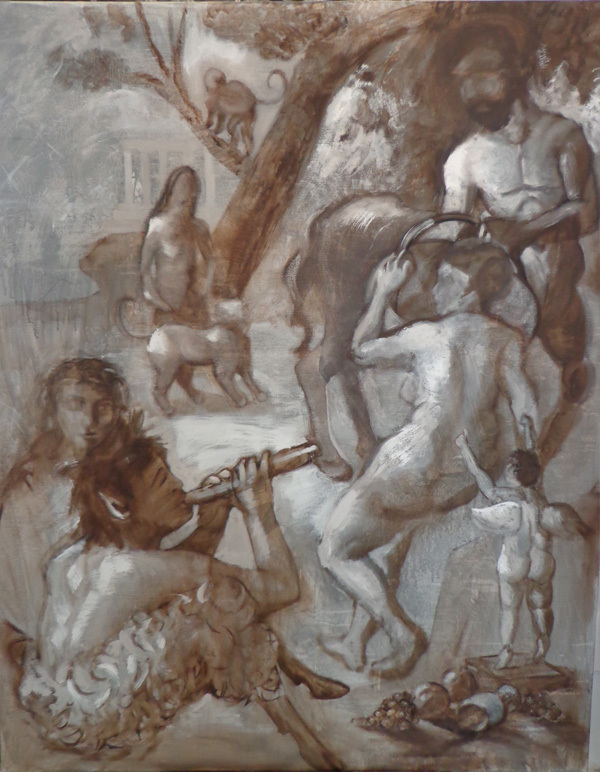 Perhaps the highlight is the Camerino frescoed by Annibale Carracci, Caravaggio’s great rival. It is tastefully lit and beautifully decorated, and contains fine classical statues in the niches; the mythological scenes of the Loves of the Gods are a dancing mixture of exuberance and restraint, libidinous and learned. Baroque decorative painting starts here. We needed a walk. Off to San Eustachio to admire our machine, and to drink a cup. From there we went to San Luigi dei Francesi, which was in restauro, and thence to San Agostino to admire Caravaggio’s moving Madonna di Loreto (the peasant with the dirty feet), Raphael’s Michelangelesque Isaiah, Andrea Sansovino’s lovely marble Madonna and Child with Saint Anne, and Jacopo Sansovino’s fine but ickily venerated Madonna del Parto. For dinner we all walked to a fancy place near the Farnese. It is fashionable and lively and has good food. Liz had tonno carpaccio and scallopini di limone. I had two-color pasta with ceci and clams. Fresh frutti di bosco suited all for dessert, and a Sicilian white wine proved extremely refreshing. The gently twinkling Christmas lights strung over many street of the Centro Storico echoed our mood accurately. Back in the room, I thought to put the television on after I lay down, but fell asleep before I managed it. Liz was already asleep. Friday again was sunny. Liz and I strolled about the Campo. Later, we went, mostly by bus, to the new Museo di Corso to see a great exhibition: “From Rembrandt to Vermeer: Civil values in 17th century Flemish and Dutch painting”. The museum is another refurbished old palazzo. There were two paintings by Rembrandt, a couple by Rubens, a couple by De Hoogh (one a masterpiece), and the general level was very high. 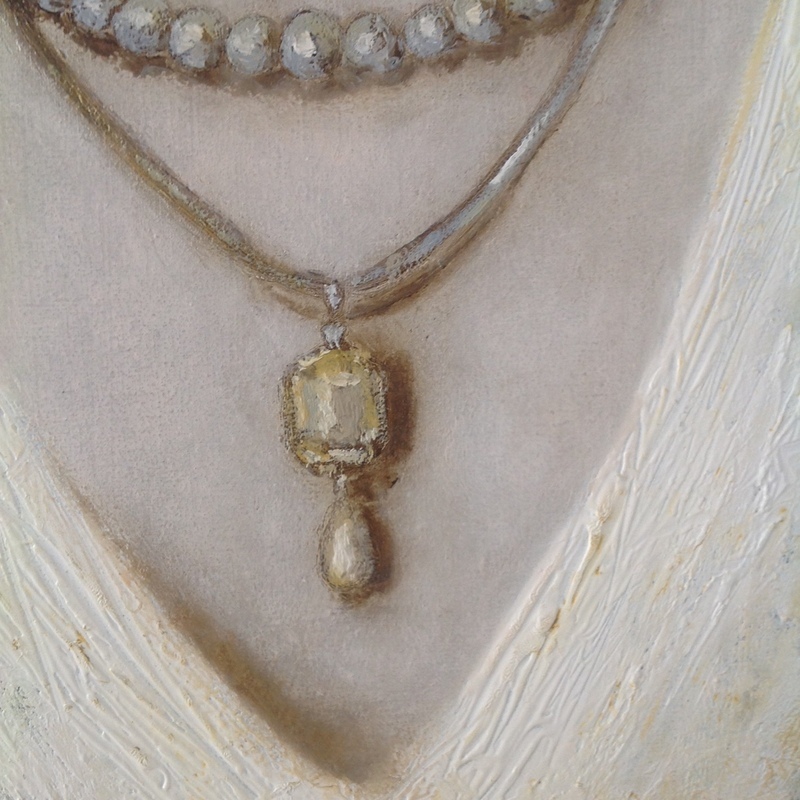 They all came from Berlin’s Gemaldegalerie, and among them was Vermeer’s Woman with a Pearl Necklace, a masterpiece of the geometry of light. Elegantly dressed, she admires herself in a mirror on the wall. One of Vermeer’s great ones, it can be quietly contemplated for a long time. This was a perfect show for us, for it does not compete in the mind with Bellini – the sensibility is too different. We went for a walk, and ended up at a shop where Jane had purchased a blouse on the preceding day. Liz bought a silk scarf. The shop’s owner took us to his girlfriend’s little restaurant, where we had lunch. We spoke Greek with her, who lived much of two decades in Rhodes. Liz and Jane had beef with various pâtés, I had a voluptuous crostone, and John had tiny gnocchi. After a walk past the Trevi fountain, we indulged in gelato at Giolitti. John had booked tickets for a 5:00 o’clock concert in Sant’ Agnese, Borromini’s undulating church on the Piazza Navona. The church has been renovated, and though small feels spacious and sparkling; the over-the-top statuary is by Algardi’s followers. The concert was in Borromini’s sacristy, which has just reopened. An excellent Norwegian violinist played a Bach Partita, then a virtuosic modern piece, and then, accompanied by an Italian pianist, the Franck sonata, which I always enjoy, vulgar though it be. We ate at an old favorite, Da Sergio, where I had boiled beef and cicoria. O.K., I admit it, I had another gelato for dessert. You are currently viewing the search results for rubens.